The conference season is in already and you will rather be overwhelmed with the large number of businesses who have been asked for more and more local link building tips. The conventional link builders only target links from the websites which have high DA or Domain Authority. Most of them are too cautious and alert about Penguin and all they want is as much link juice as is possible. 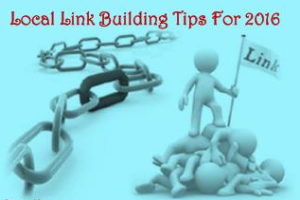 Here are some local link building tips that you can take into account in 2016. Offer military or alumni discounts: You may offer certain discounts to alumni of some of the local universities. Once you have a particular page on your website which explains the discount, it becomes easier to reach out to the alumni groups and get them added to your website. You should know that military discounts usually work well but they need more follow-up to achieve links. Local meetings: If you’re not aware of this, you should know that local meetings are more than a secret way of getting local links. You can opt for visiting Meetup.com and check out some of the most active groups which are situated in the area. First do a research of the groups which are related to business and then branch them to the other groups. Offer your place of business and you can simply get an easy local link target. Be the host of a community event: How about throwing a party and inviting the entire city to that party? Check out what exactly the auto dealers do on holidays and if you see that they’re free, you can opt for such events which can help you deal with a lot of people who can then work with you to give you links. Leverage the relationships which you’ve built: Unless you’re someone who is a novice, it can be taken for granted that your business is already a part of a local community. You have built many relationships with various other local businesses. Hence, take advantage of the relationships and use them for link building purposes. First seek help of those which are similar to yours or even those with unrelated verticals. Therefore, if you’re into the market for local link building, take into account the above mentioned tips for better link building. Ensure giving in your best to reap the best results.